A detailed DIY instruction sheet with full-color photos is included with all orders. One roll of Shadowline trim vinyl is enough to completely cover all upper & lower window trim pieces on both sides of most vehicles (coupe or sedan). Larger vehicles such as SUVs and wagons may require two rolls. All rolls are 30 feet (9.15 m) in length and are available in three widths: 3" (76 mm), 4" (101 mm), and 5" (127 mm). The discount savings on multiple roll purchases only benefits those applying Shadowline trim vinyl on two or more vehicles. We don't want you to purchase more than you have to. 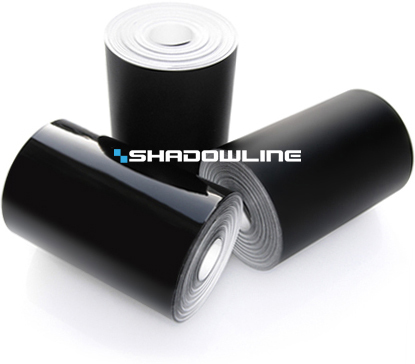 For wholesale pricing on orders of 6 or more rolls, please contact us at orders@shadowlinetrim.com. A detailed DIY instruction sheet is included with all orders. Roof vinyl overlays are priced at $10.95 per linear foot and are cut from a 48" wide roll. Each order comes with an application squeegee (shown above) to properly apply the vinyl. Please measure your vehicle's roof before ordering and select the appropriate length. You want a vinyl sheet that is slightly larger (at least 2" on all sides) than your roof's total area to account for "wiggle room" while positioning and applying the vinyl. We cannot give refunds for purchasing an incorrect size. Remember...measure twice, buy once. To purchase longer continuous lengths over 84", please email us at orders@shadowlinetrim.com. ATTENTION INTERNATIONAL BUYERS: All roof vinyl sheets are shipped in a rigid mailing tube that is 50" (127 cm) long x 3" (7.6 cm) in diameter. Due to package size restrictions to some countries, we are only able to ship to countries that allow packages over 50" in length. We can ship roof vinyl overlays via USPS Priority International to the following countries ONLY: Canada, Andorra, Macao, Austria, Malta, Azerbaijan, Belgium, Micronesia, Denmark, Netherlands, Finland, New Zealand, France, Norway, Germany, Poland, Gibraltar, Portugal, Great Britain and Northern Ireland, San Marino, Greece, Slovakia, Ireland, Spain, Italy, Sweden, Japan, Switzerland, Liechtenstein, Vatican City, and Luxembourg. Before purchasing, email us at orders@shadowlinetrim.com for a shipping quote. If you make a roof vinyl purchase before contacting us you will be emailed a Paypal invoice for the outstanding balance of the shipping charge. High-quality, durable squeegee for vinyl application. Featuring high-stability twin ribs for easy handling and pressure control. Possesses a true "I.M." edge, mid-level memory, medium flexibility, and high glide. Ideal for applying light to medium weight cast vinyl. 3" wide by 4" long. Our BMW roundel & emblem vinyl overlay sets allow you to alter the blue and/or white sections of your BMW's roundels & emblems to custom colors to give your car a unique look. Each set is precisely die-cut to perfectly cover the specific size roundel & emblem sections of each BMW series vehicle. All sets include overlays for the hood and trunk roundels, OEM wheel center caps, as well as the steering wheel emblem. Simply choose between our BMW Factory Paint-Matched Metallics & Non-Metallics, 3D Carbon Fiber, Gloss and Matte Black Overlay Sets and select your BMW's series/production code from the drop-down menus below. Also, be sure to state if your vehicle has 68mm or the newer 70mm wheel center caps. The 68mm wheel cap has a gray plastic ring around the outside edge. The newer 70mm cap has a chrome outer edge and is pictured in the photos on the BMW Emblem Vinyl Overlay Sets page. To purchase larger quantities at wholesale pricing, please email us at orders@shadowlinetrim.com. 68mm or 70mm wheel caps? NOTE: Each set contains the vinyl overlays, not the actual BMW emblems. One color & style per set. To change both the white and blue sections of your BMW's roundels and emblems, you'll need to order two sets—one for each color you want. Colors on screen may vary due to different monitor calibrations. If you have any questions please email us at orders@shadowlinetrim.com. $10 Refund on your order! Copyright © 2018 Shadowlinetrim.com. All Rights Reserved.